Our mission is to help yoga teachers create fulfilling careers. This means building a thriving yoga business AND a life you love. Yes, absolutely! We’ve found that by empowering yoga teachers with some basic business and technology skills, you can thrive in our modern world (without sacrificing your yoga practice or risking “burnout”). For some yoga teachers, this means increasing freedom in your life, for others this means earning a bit more each month without overworking yourself. We both grew up in Minnesota and spent a combined 10 years in Corporate America before completing our our yoga teacher trainings in 2012. Soon after we quit our corporate business/marketing jobs to travel the world while Anne teaches yoga. In 2013 we launched TheYogaNomads.com – a place for yoga teachers (and students) to support each other, share knowledge, and get results. We help yoga teachers build thriving businesses by creating a website, building a following, and launching a premium offering. Our community has grown a TON since the early days. Read our full story here. Thanks for all your support! Yoga teachers deserve a fulfilling career — earn a fair wage, freedom to pursue your passions, and support a family. Yoga teachers should invest in themselves — learn business & technology skills to compliment your yoga biz. 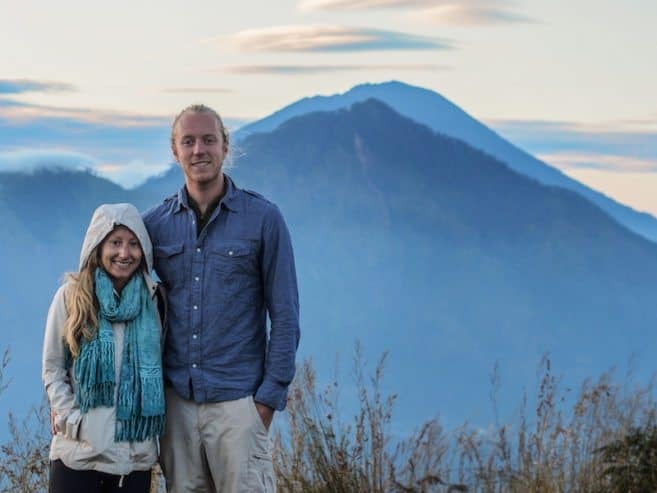 After connecting with thousands of yoga teachers around the world… we soon realized that most yoga teachers are struggling financially. However, for better or for worse – we all need money to get by in our modern world. Yoga teachers are no exception. It’s not fun being broke. So, let’s stop pretending being broke is the path to enlightenment. Unfortunately, most yoga studios cannot afford to pay teachers enough. I know that sounds crazy, but it’s true. 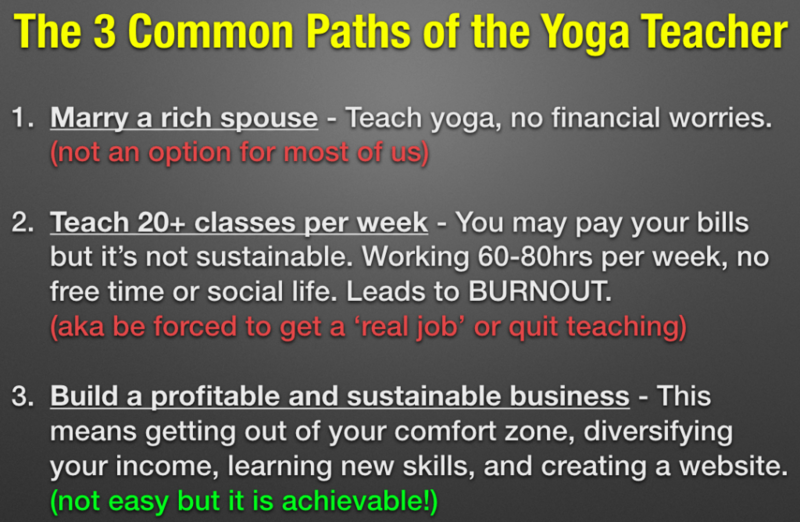 *We focus on #3 by helping yoga teachers build profitable and sustainable businesses. The Secret Sauce of “Successful” Yoga Teachers. #1 They all have their own website – Which acts like a home base for everything business related. They direct their students to their site, build deeper relationships with their students, and use their website as a marketing tool. 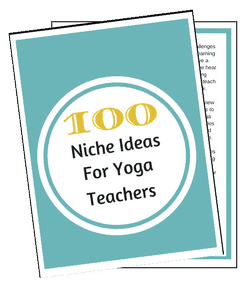 Download your beginners guide to creating a yoga teacher website. #2 They think outside the studio – Successful teachers know that the studio cannot pay desirable wages. So they use the studio to get good at teaching and to build a following. Then they create a premium offering outside of the normal “group studio classes.” Premium offerings include workshops, retreats, private yoga, online offerings, etc. 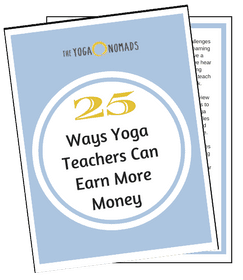 Browse 25 ways yoga teachers can earn more money. #3 Never stop learning – Successful yoga teachers commit to improving as a yoga teacher AND an entrepreneur. They surround themselves with like-minded supportive people, they read books and blogs, take online courses, etc. Start with our best stuff first! We realize there is a TON of stuff on site… so we created this page to help you best navigate. The best place to start is to download our Beginners Guide to Creating a Yoga Website (7 Steps) which is completely FREE. Every Thursday, we publish a new article on this site and send an exclusive newsletters to our email list. We believe there are 3 common stages to the entrepreneurial journey for yoga teachers. Obviously life isn’t this simple and no one likes to be put “in a box,” however we find using stages like this helps us to stay on track. You graduated from YTT with a new perspective and you’re full of energy, but just not quite sure what to focus on. You know you want to teach yoga, but you probably still have a “second job” to pay the bills. Early on it’s all about learning. Get tons of experience teaching in different environments – see what you like and what you don’t like. It’s important to build your confidence, test out themed classes, different sequences. You’ve been teaching consistently for at least 6 months (or maybe a couple years) and your students love you. You’re running around town teaching group classes at the studio trying to pay the bills. 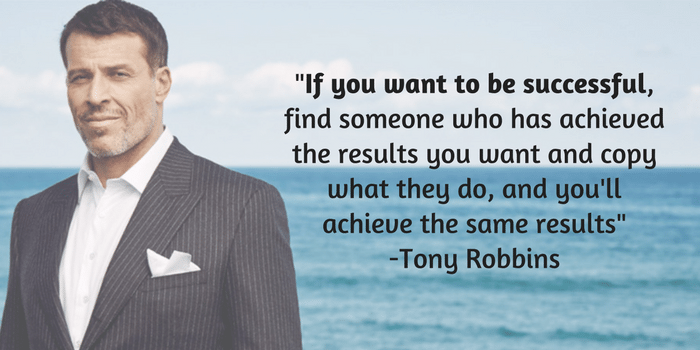 You desire things like more freedom, less stress, and more income. By this point, you’ve already identified your niche and have some regular students. Now it’s time to learn some business skills… start by creating a website & building a following of like-minded people. You’ve been in the game a while now, you have endless teaching opportunities, but you’re seeking something more. A new challenge perhaps? You’re not sure how to leverage your business to create a life you love. You know what you want, but you’re not exactly sure how to get there.